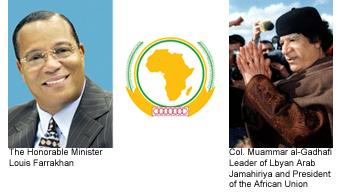 It is a great honor and privilege for me, the Nation of Islam, and others to welcome Brother Leader Muammar al-Gadhafi, Leader of the Libyan Arab Jamahiriya and President of the African Union to his first visit to the United States of America to address the 64th Opening Session of the United Nations. The greatest of his efforts, in my humble opinion, has been to foster the idea of Marcus Garvey, George Padmore, Kwame Nkrumah and Gamal Abdel Nasser to move the independent states of Africa to form the United States of Africa, thus bringing Africa fully and powerfully into the 21st century as a major contributor on the World scene in all aspects of World Affairs. You may ask why we feel honored and privileged to welcome him; it is because ever since we have known him, he has been a friend of the struggle of Black people all over the World for true liberation. In Brother Gadhafi's Green Book, he mentions the rise of Black people to positions of prominence, eminence and power in World Leadership. He has not only written and said this, he has put the scholarship and oil wealth of Libya behind, not only raising the standard of living of the 6 million Libyan people, but also has used the scholarship and wealth of Libya to raise the condition of the poor masses throughout the earth. By his charity and the guidance he has given to so many, he has proved that what comes from his pen and his lips is deeply rooted in his heart. In 1971, he loaned the Nation of Islam under the Leadership of the Honorable Elijah Muhammad $3 million. That money allowed us to purchase the beautiful Greek Orthodox Church which became the National Headquarters of the Nation of Islam in Chicago. In my effort to rebuild the Nation of Islam in accord with the Teachings of the Honorable Elijah Muhammad, Brother Gadhafi loaned the Nation of Islam $5 million for our economic development then forgave the loan. Then through the Islamic Call Society, the religious arm of Libya, sponsored one the largest Islamic conferences in America bringing Islamic scholars from all over the world to Chicago. The Islamic Call Society also sponsored two of our World Friendship Tours, which allowed us to visit over 53 countries. Brother Gadhafi was and is a true revolutionary who is still evolving towards the destiny that Allah (God) has for him. As you may know, in 1986 the most expensive assassination attempt in the history of the World was perpetrated against Muammar Gadhafi by the Government of the United States of America under the leadership of President Ronald Reagan. In that assassination attempt, he narrowly escaped, but his adopted daughter was killed and forty-one Libyans and other foreign nationals died in the bombing raids that took place in Tripoli and Benghazi. There is no Nation that does not desire to have a friendly and meaningful relationship with the United States of America. A promise was made that if Brother Leader Gadhafi abandoned the idea of making Libya a nuclear power and agreed to pay reparations for the unfortunate loss of life of 270 persons in the Pan Am Flight 103 bombing that took place over Lockerbie, Scotland; the sanctions placed on Libya by the United States and the United Nations would be lifted. These negotiations took place under the administration of President George W. Bush. Many of us that followed these events thought that Libya was made the “fall guy” for this unfortunate tragedy. America first said that the perpetrators of this act were from Iran, then they said Syria and lastly they focused on Libya. Two Libyan nationals were turned over to the World Court and were tried at the World Court in The Hague under Scottish law. One of the Libyan nationals was set free (Lamin Khalifah Fhimah) and, over the protest of many, Abdelbaset Ali Al-Megrahi was found guilty and spent the past eight years of his life in prison for a crime that most Libyans never believed he was guilty of. From what I have learned, there have never been any negotiations for business or oil deals between Libya and England or Scotland that did not involve the potential release of Abdelbaset Al-Megrahi. A few years ago Bulgarian nurses were accused of injecting Libyan children with the HIV/AIDS virus. Over four hundred Libyan children were injected. These nurses were tried in a Libyan court, found guilty and sentenced to death. The cry came up from the West: America, England and the European Union, petitioning Muammar Gadhafi not to put these nurses to death. Then, a request was made and pressure was applied to release them to serve time in a prison in their own country. Libya released these nurses and I understand that while the plane was carrying them from Libya to Bulgaria, a new arrangement was made by Bulgarian authorities and these nurses were received with a heroes' welcome in Bulgaria and were set free not spending one single day in jail. Abdelbaset Ali Al-Megrahi's life imprisonment was commuted for medical reasons by the Scottish Government and he was released and sent home to Libya to die. A great hue and cry came up from America and other places condemning the release of this Brother. The Obama administration joined in condemning the Scottish government's action apparently forgetting America's request under the Bush administration to release the Bulgarian nurses to their own country and release them from the penalty of death. Brother Leader Muammar Gadhafi has shown that Libya is ready to take its place in the family of Nations as an equal and respected partner. The sanctions, to the best of my knowledge, have been lifted and a new era in the American-Libyan relationship is now emerging. There is much that America and Europe can offer to Libya and Africa, and there is much that Libya and Africa can offer to America and Europe in an atmosphere of mutual respect. The emergence of Libya on the World stage is now a reality in that Libya is now serving on the United Nations Security Council and a Libyan diplomat is presiding over this year's General Assembly. Brother Gadhafi's insistence on Africa's becoming one great Nation with Africans in the Diaspora assisting in the development of Africa, is probably the greatest move that Brother Leader Gadhafi has made in his forty years of Leadership of Libya. Libya is building anew. Libya is investing tremendous resources in the development of Africa and Libya is also seeking to invest in America. While Brother Gadhafi's visit to America may attract protestors, which is the right of any American to do, however, I hope it will also attract those of us who have honored and respected Brother Gadhafi over the years for his tireless efforts in Black liberation and the struggle of the masses. On a personal note, years ago I told some revolutionary brothers in Africa that I too am a revolutionary but the revolution that I am concerned with is not fostered by the use of carnal weapons. The revolution that I was then involved in and am involved in now is fostered by the Divine Light found in the Bible and Holy Qur'an. There is no real revolution as long as we remain mentally enslaved by our former colonial and slave masters. We must be made new and that can only happen if the veil of ignorance is removed and replaced with that knowledge that will bring up a new idea and vision. This kind of revolution will change Africa and the World. When Brother Gadhafi saw the work of the Nation of Islam in cooperation with other Black Leaders and organizations that produced the historic Million Man March, he offered to help our people with an infusion of capital to pursue those things that would be meaningful in the building of our communities. In the book of Isaiah (61:4), it is written that we will rebuild the wasted cities. We the Blacks, the Hispanics, the Native Americans and the poor Whites live in the wasted parts of the American cities. Among us however, is the talent, energy, gifts, skills and will to rebuild the cities and make our neighborhoods decent places for all of us to live. We hope that in the gathering of our best and brightest minds producing a workable and mutually agreeable plan that Libya will partner with us in rebuilding the wasted cities. This would create job opportunities for our young people and help us with international trade and commerce. This would allow us to build in the West and share the richness of the wisdom we have gained from our sojourn in America with our Brothers and Sisters on the African continent. Then, from both sides of the Atlantic, we might find ourselves through our noble work worthy to be respected among all the civilized societies on our planet.